High cholesterol is a risk factor for heart disease, so it’s important to keep your numbers in check. LDL cholesterol clogs up your arteries and makes them stiff, so your heart has to work harder as a result. This is problematic because over time this extra strain can cause damage and even trigger a heart attack. You know that you need to exercise regularly and watch what you eat if you want to reduce cholesterol. Processed foods, trans fats, and saturated fats are the common culprits behind high LDL cholesterol levels, but there is another factor to keep in mind that you may not be familiar with. 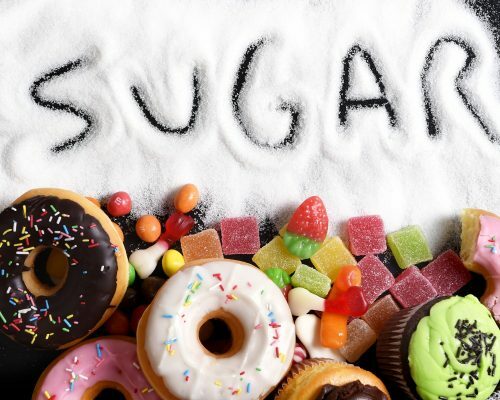 Sugar is usually a cause for concern as a contributor to diabetes and obesity, but believe it or not, sugar can actually be contributing to your rising cholesterol levels. The association between sugar and cholesterol is a complicated one. Let’s look at caloric intake first for a better understanding. The calories we derive from food are used to fuel our body. The more calories you burn, the more you will need to ingest. Unused calories turn into triglycerides, which is a type of fat that circulates in the bloodstream and contributes to cholesterol. When you regularly eat sweets and other sugar-ridden foods, but do not burn off these extra calories, not only does it lead to weight gain but it contributes to higher triglyceride levels – which, as mentioned, raise your cholesterol. High triglyceride levels lead to hardening of the arteries, increasing your risk of heart disease, heart attack, and stroke, as the blood cannot pass through properly. If the built-up plaque along the artery walls breaks off, a blood clot is formed, which can completely block off the blood flow to the heart, triggering a heart attack. Aside from food, you can get lots of sugar from beverages, like soda. Whenever you see terms like sucrose, fructose, dextrose, lactose, and maltose on the label, that means there’s sugar involved. Even natural sugars like honey or agave can raise your triglyceride levels, so it’s important that you monitor your intake even of these healthy treats. If you’re struggling to manage your cholesterol, take a look at how much sugar you are consuming and ask yourself if you are taking the necessary steps to burn it off.